When you say Canadian fashion designers, you get a few reactions. Those in the know nod and are happy to discuss their favourites or the state of the Canadian fashion industry; others assume you mean Club Monaco and Joe Fresh; and then there are the ones who don't really know who's designing in Canada. 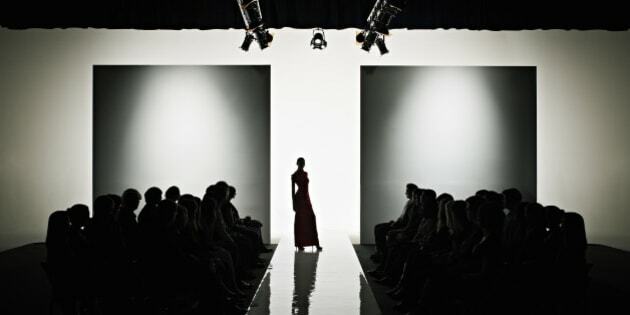 While we don't have the glamour of Paris, London, Milan and New York, the Canadian fashion scene has some great fashion designers doing some fun things. Making a knit dress out of toilet paper? Yes, we have him. So the fashion designer who knitted a dress out of toilet paper? His name is Dylan Uscher and he knits, often on giant needles. Want a giant scarf or toque? He's got it. His accessories have been so popular that he's collaborated with Greta Constantine, MAC cosmetics, and even knitted an Interac sign for their holiday campaign. Lucian Matis came to Canada's attention as the second runner up of the first season of Project Runway Canada. Since then, his work has ranged from fantastic (ruffles, frills, ribbons!) to a sleek, pared-down minimalism that always remains luxe. This womenswear designer is based in Toronto. She's pretty new, launching her label in 2012 with a collection of stylish, wearable clothes that cater to the modern woman with a hint of retro style. You may have seen his name inside shoes or associated with Barbie, but Dixon has been around for a long time designing elegant dresses worn by Holly Cole and Jennifer Love Hewitt. Want luxurious ready-to-wear women's clothing? Want a stunning jersey dress? Waiting an hour for their fashion show to start? Then you want Greta Constantine, the line designed by Kirk Pickersgill and Stephen Wong. And don't worry guys, they have Ezra Constantine for you so you don't feel left out. He's often described as the bad boy of fashion, and he walked away with the top prize during the first season of Project Runway Canada. Biddell is guaranteed to send something glamorous down the runway that might remind you of the Studio 54 days. Taddeo mixes silk, leather, fur and jersey in his work creating clothes that are trendy and ready-to-wear yet not your traditional everyday outfits. You might not wear some of his pieces to the office, but it'll look great when you go dancing that night. Neigum won the Toronto Fashion Incubator's 2012 new labels prize by sending sharp-shouldered blazers, leather jackets and chunky knits down the runway. He's based in New York but comes back to show his work at MasterCard World Fashion Week. You'll be seeing Stevenson's clothes in Targets across the country next year. This designer, who designs her own prints, makes clothing that will fit right in your closet. Now that we think about it, pair her print with a Hilary MacMillan skirt and you'll be perfect for work. This is the label by Matt Robinson and he does menswear (See, gentlemen? we didn't forget about you!) His line offers an upmarket version of men's workwear so you can get vests, worksheets, and of course, shorts. This fashion inspired post has been brought to you by MasterCard in celebration of the launch of Stylicity and the arrival of World MasterCard Fashion Week. From Oct 18 – Nov 3, shop with MasterCard and receive exclusive offers at over 150 Stylicity locations in Toronto and online.